According to Wikipedia "Interfacing is a textile used on the unseen or "wrong" side of fabrics to make an area of a garment more rigid". It can be found in collars, waist bands, coats, purses, buttonholes, cuffs, to name a few. Some are sew on, and some are fusible, which means you can apply it without sewing, by using heat (iron). If it's fusible, it also means there is glue, so be sure to take that in to consideration. Make sure to use "sewable interfacing" when sewing or your needle will gum up and stop the needle from sewing. There are many choices, so my best advice is to review this page, which will highlight a few of the choices, then read directions on package for further instruction. 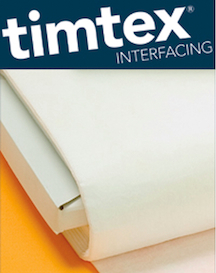 The above photo is an example of a common use of interfacing. 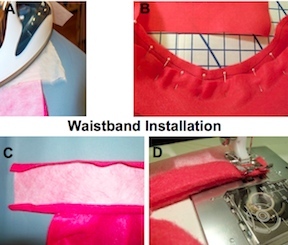 This example shows the assembly of a waistband on a Poodle skirt. It's fused onto the waistband before attaching it to the skirt. Without it, the waistband would have little structure. In this case the skirt is felt so there is a little more structure then in most fabric. For full details on installing a waistband see "Sew Waistband" , The photo above is from "Make Poodle Skirt"
Will the needle go through? If you decide on fusible, but also want to sew for reinforcement, that means your needle will be going through the interfacing. If it's sew-able, then no problem. If it's not sew-able, you will end up with a gummed up needle from the glue. Ideally you want sew-able, but wiping the needle every few stitches with alcohol and a cotton ball can get you through in a pinch. If you're using a pattern, you'll likely find recommendations. A medium weight works for most projects. It comes down to the project, fabric, and how you want it to look in the end. If it's too heavy for a fabric, it may control the fabric too much, which would interfere with draping. If it's too light, then it may not offer the structure you're looking for. If you're not sure, and the pattern is no help, or you're not using a pattern, then drape the fabric over the interfacing to see how they work together. When doing this, drape the fabric the same direction it would hang after finished and try some different poses with it. A few more examples below. This fusible Sculpting Stiff Interfacing is easy to mark; cut and fuse. You get two layers of fusible plus interfacing in one product. Give flexible; firm support to all your projects including fabric bowls and boxes; tote bags; purses and backpacks; hats and caps; costumes and accessories; home decorating including lamp shades and place mats; kids' crafts and more! Made of 100% polyester and is machine washable and can be tumble dried on low. 100% polyester for consistent thickness and texture. Firm yet flexible, and is perfect for shaping into purses; bowls and other three-dimensional craft projects. Easy to cut; mark and sew. Machine wash and dry. Package includes complete instructions for use and care.